The day after Machu Picchu we leisurely packed our bags and had breakfast before asking the woman at the front desk of our hotel to please open the garage so we could be on our way. She said something to me that I didn’t quite understand, but I was so focused on hitting the road that I didn’t bother to clarify it. 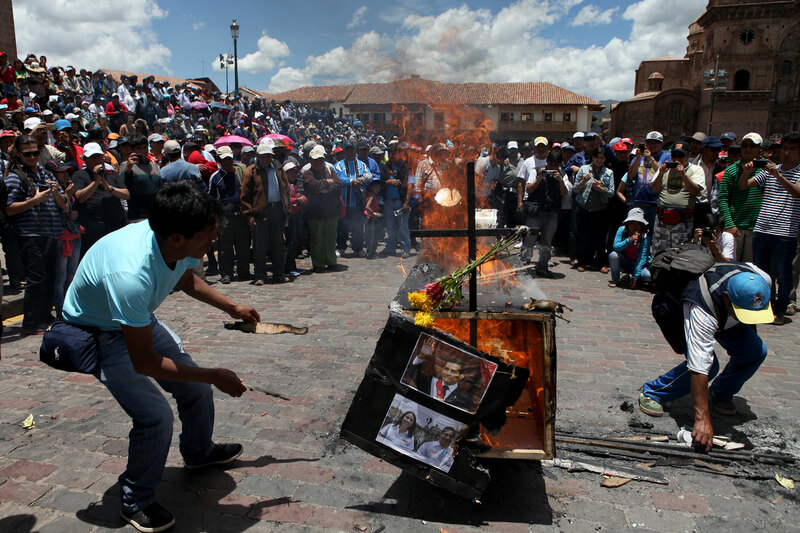 As we rolled out of the garage onto a nearly empty street and on to Cusco’s Plaza de Armas it quickly became apparent that something was going on. 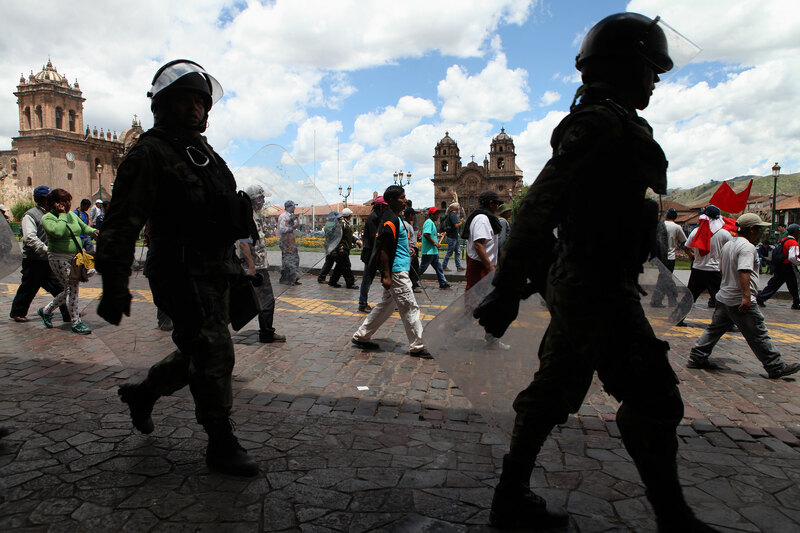 There were no cars in the plaza and a few groups of police in riot gear stood in the shade at various locations. I found this interesting as I slowly puttered behind Nathaniel, however things only got stranger as we moved our way through town. Avendia del Sol, like Plaza de Armas had no vehicles moving on it aside from a few other random motorcyclists and there were a lot of people walking freely in the street. As Nathaniel drove past a large group of men walking in the same direction we were heading one of them threw a rock at him, although I am certain by how casually it was thrown it was not meant to hurt him. At the end of Avenida Del Sol we pulled into a gas station next to a huge roundabout where people were gathering en mass. The gas station attendants told us that we would have to wait till the protestors in the street moved on before they would serve us – it was at that moment a large white truck driving way too fast whipped around the circle and was met with a volley of rocks from the protestors. It was then we realized how serious things could be getting and I asked the gas station attendants what was going on. 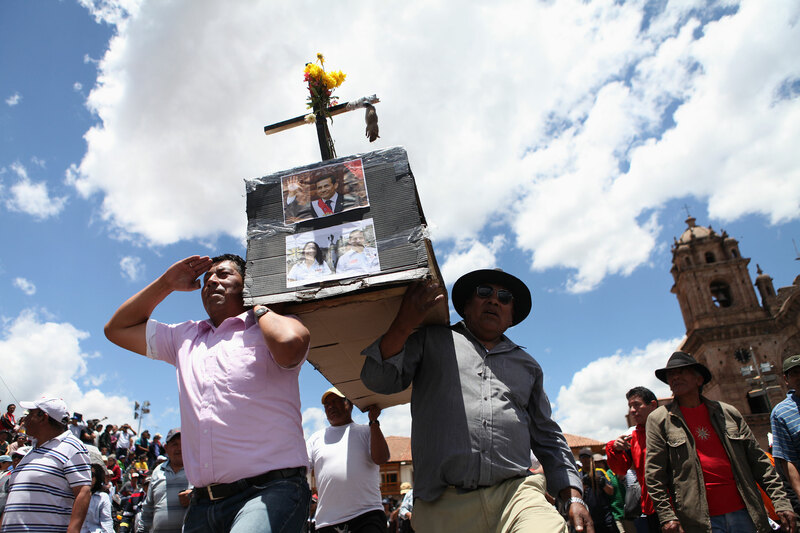 They informed me that it was the first day of a two day protest that stretched throughout the region, though mainly focused in Cusco. 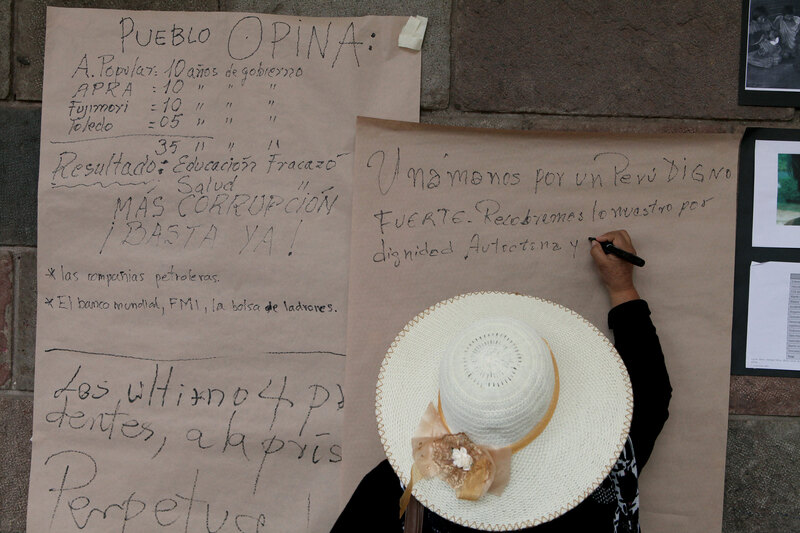 People were protesting a variety of things including inflated government salaries, gas prices and false promises made by President Ollanta Humala. It was because of these various grievances that people had called for a strike of all motorized transport – to prevent the use of gasoline. After a few minutes the gas station attendants motioned for Nathaniel and I to go to the pump furthest from the street so we could fill up. They told us that they didn’t think we would be able to leave the city and they seemed frightened by what was going on. Wanting a second opinion we exited the station and approached a group of police officers to ask them what they thought. It was at this point that the photojournalist in me started having an all out fight with the Autopista End part of me – Photojournalist Alex loves photographing protests. 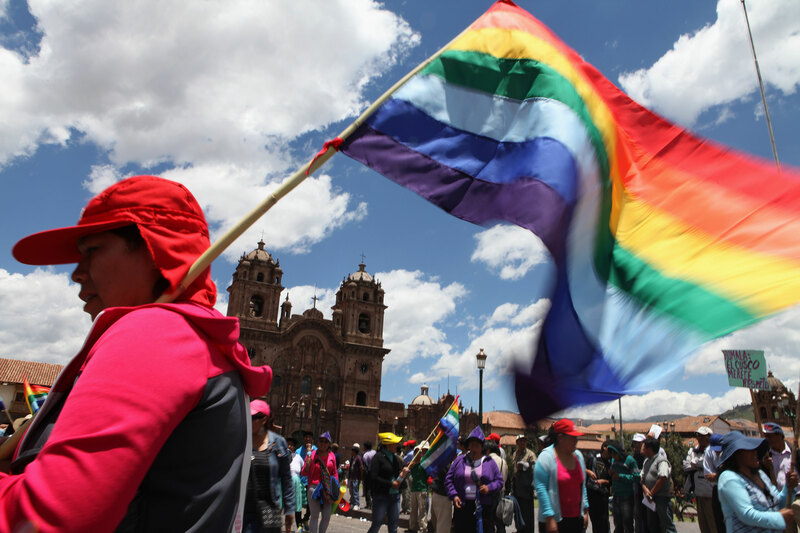 I knew we really had to be getting out of Cusco, on the other hand the idea of skipping this protest was getting more and more painful by the moment. The police officers, probably not wanting to alarm us tourists, told us we would have no problem getting out of the city, although it would be easier if we waited till the afternoon to do so. The idea of sitting around in our gear for hours and hours was really unappealing to us so we continued on our way down the main road out of town till we saw a wall of people blocking the way. We parked about 6 blocks away and watched as several other motorcyclists and cars approached the people and quickly turned around and gave up. Nathaniel and I discussed our options and decided the best thing for us to do would be to go back to the hotel, stow away the bikes and hit the streets to document was going on. Latin American governments don’t have a great track record when it comes to human rights violations and protests so if anything illegal happened I would feel guilty not being present to document it. In the time it took us to leave our hotel and then turn around to head back to it the protest had picked up steam. There was no confusion as to what was going on now that Avenida Del Sol was similarly blocked with a wall of people waiting to stop any motorists from heading into the city center. We stopped a safe distance from the protestors puzzled about what to do. 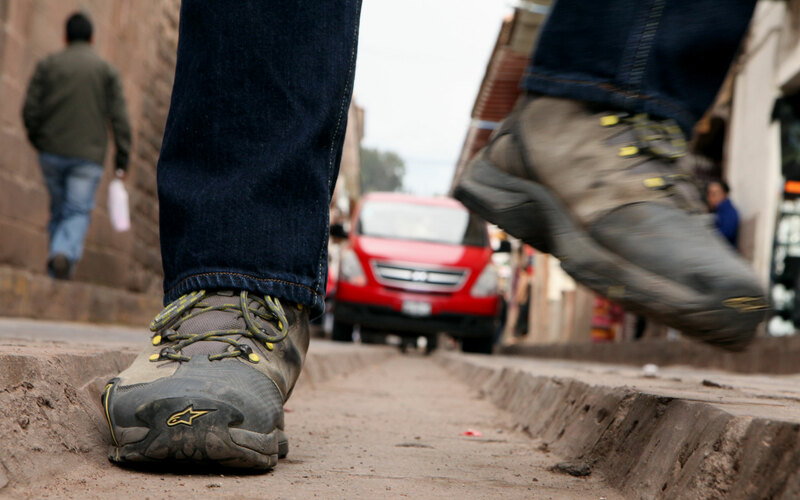 They certainly hadn’t blocked EVERY street that could lead us back to the hotel, however riding blindly on the steep cobblestone streets of Cusco was another unappealing option (remember what happened to Nathaniel’s ankle). We hadn’t been stopped for a full minute before two men on a small motorcycle pulled up next to us. The guy on the back was filming with an old fashioned camcorder so I asked them if they were with the television news. The driver of the motorcycle cheerfully answered that they were and I told him I was a photojournalist from the United States. He got an absolute kick out of that and asked where we were going. I told him we were trying to get back to our hotel and described to him where it was. He thought a moment and said they were also trying to get back to Plaza De Armas and told us he would lead us back to our hotel. “Follow me!” – and he was off. We wound around through some small neighborhoods around the city center full of kids enjoying the traffic free streets with spontaneous soccer and volleyball games and in about 10 minutes we were back to our hotel without having encountered another blockade. I thanked the moto-journalists profusely and with a grin and wave they were off to continue their work. I was absolutely brimming with happiness being part of the journalism community at that moment- we have a strong sense of camaraderie that transcends borders. The hotel staff smiled when I came back in the front door and I joked with them about what was going on outside. We were given the same hotel room we had spent nearly a week in and were soon walking towards Plaza De Armas (the focus of the protest) me carrying a 5D Mark II and Nathaniel with his Go-Pro and Canon G12. Photographing the protest was really fun for me because I haven’t had the opportunity to shoot an event like that in a long time and it is one of my favorite things to photograph. I love covering protests because the energy is high, you have to be alert at all times and people are usually so involved in what they are doing photographers can be truly invisible as they do their work. Even the most laid back of subjects tend to be a little self aware in front of a camera, but that is hardly ever an issue during events like this. I spent the next several hours photographing the protest and seeing if they AP was in need of any photos of the protest. Spoiler: They didn’t need the photos, however the Photo Director for the region told me he liked my work and to feel free to contact them again if I came upon anything else I felt was newsworthy. With that bit of encouragement Nathaniel and I set off to get something to eat and re-prepare to leave Cusco the next morning. 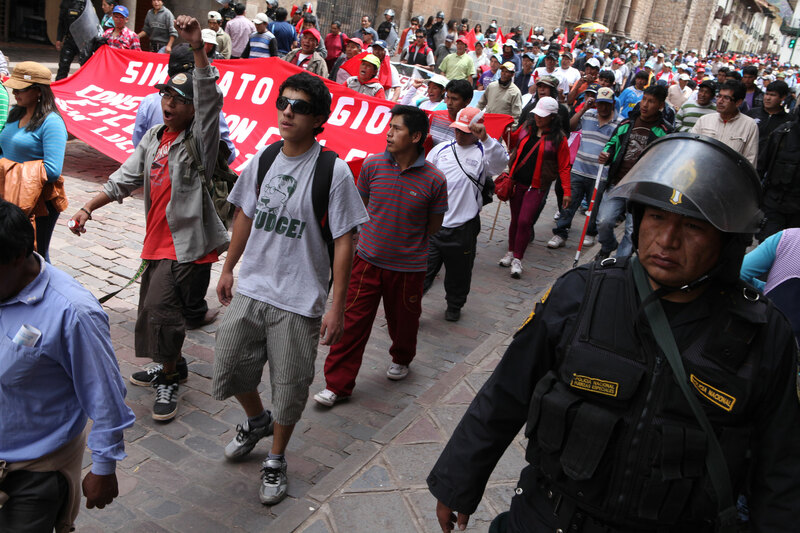 We ended up spending twice as much time as we wanted to in Cusco and even though we knew the blockades would still be up the following day we decided to roll the dice and make it happen. 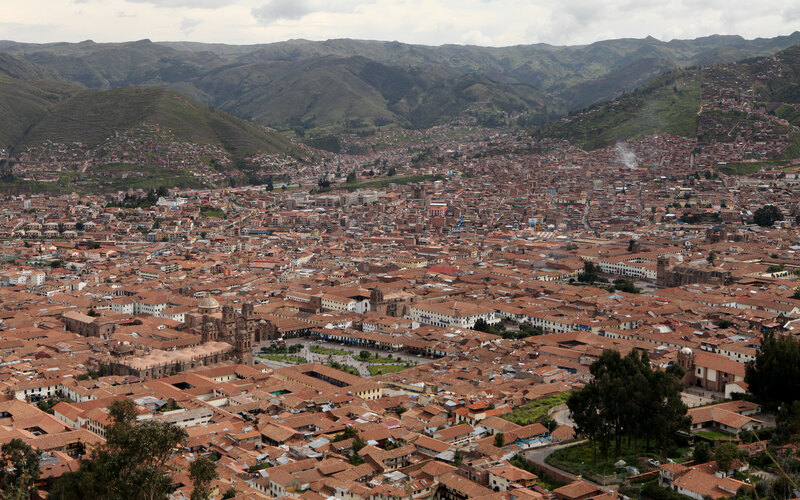 I feel the need to paraphrase the day we actually left Cusco because this blog is getting really long and I don’t want to bore everyone to death who is still reading. As we prepared to pass the first blockade out of the city some older gentleman told us to tell the protestors we were tourists and they would let us through. As Americans we are particularly nervous about volunteering that information (with all our gear on it’s hard to tell we are foreign), although the advice turned out to be invaluable for the next 8 hours. The first blockade began hurling rocks and other things at me as I approached so I turned on my turn signal well in advance, stopped about 15 feet from them and motioned for someone to come up and talk to me. A man in a brightly colored sweater raised his arms in an effort to calm people as he walked up to me. He asked me one question – Are you tourists? When I said yes he started yelling at the crowd to let us through and that we were tourists. People kept shouting at us from all directions, but they stopped throwing things and let us through. After some advice from the police just past the barricade we attempted to take the smaller streets to get out of the city. We spent nearly three hours backtracking, winding through neighborhoods and crossing pedestrian walkways in the most absurd places trying to get past all the barricades. I personally did not want to deal with having things thrown at me a dozen or so times and explaining over and over that we were extranjeros and in no way apart of the problem. Then it began to rain… a blessing and a curse. My gloves and riding pants are not fully water proof so as I started to get colder and wetter people began to thin out and we ventured back to the main road out of town. 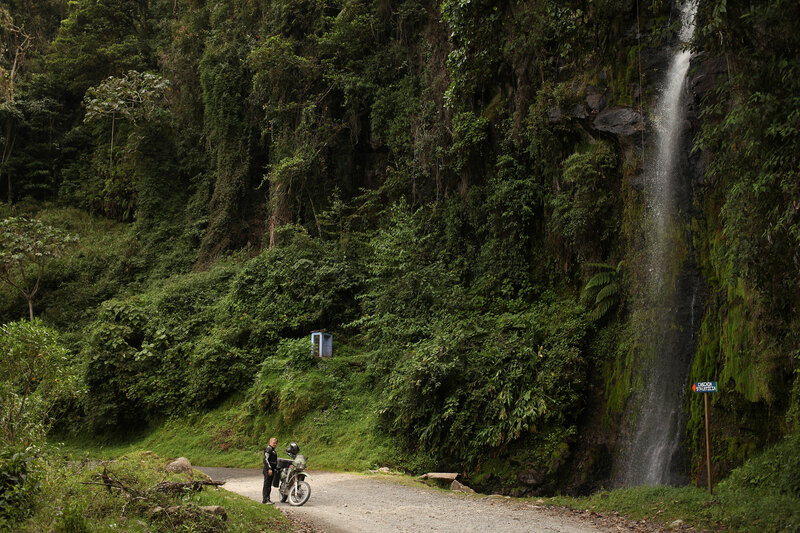 When we finally escaped Cusco the highway (beautifully paved by the way) was full of rocks, broken glass, piles of cacti, barbed wire, trees, burning tires, bits of cars and everything else people could get their hands on to slow or stop the flow of traffic. There were at least 5 places the highway was totally blocked and I had to ask the people manning the blockades for permission to pass through. Although one group of people asked for money as we passed (we said no) everyone was perfectly willing to let us through when we identified as being non-Peruvians. At one blockade they were having a meeting and I fell over as I tried to ride my motorcycle over the pile of trees they had laid across the road. As soon as I hit the ground 4 or 5 men from the group were helping me pick the bike up and lifted it over the barricade they had built. 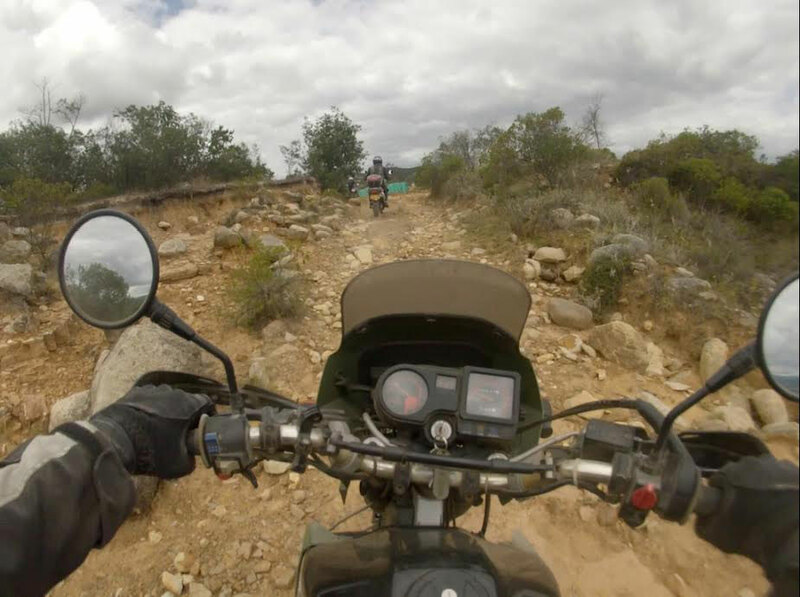 Our motorcycles tend to have a cult following in the United States and I quickly learned many months ago that KLR love stretches across borders, languages and hemispheres. I was never afraid of what would happen to Nathaniel and I once we rode off into the sunrise from Oakley California towards I-5 and turned south. 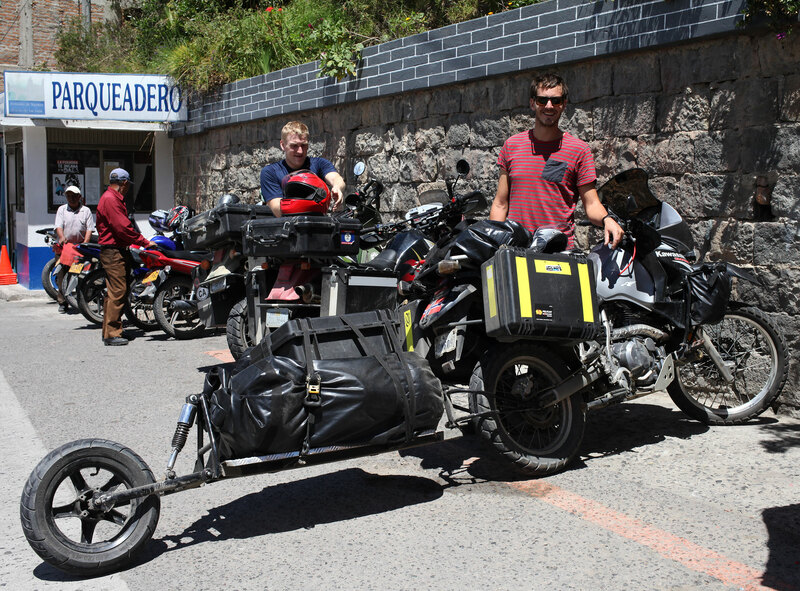 But, I did spend a lot of time worrying about how to properly prepare for the trip e-mailing people like Wes Siler (of Ride Apart), Brian Frank (fellow photojournalist and motorcycle enthusiast) and Alex Chacon (of Expedition South). Wes, Brian and Alex were all awesome (none of them told me we were idiots!) but in my preparation obsessed craze I found several KLR owner groups on Facebook. 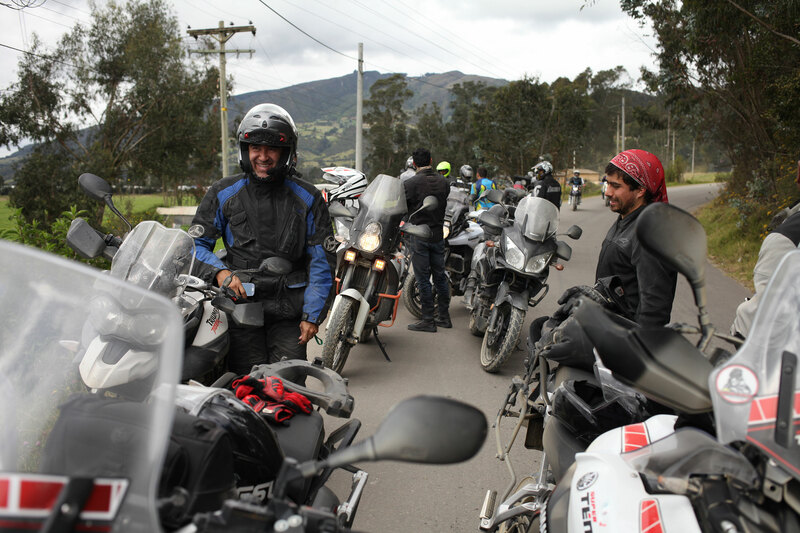 The most lively seemed to be TEAM KLR COLOMBIA so I sent them a join request which they quickly accepted. 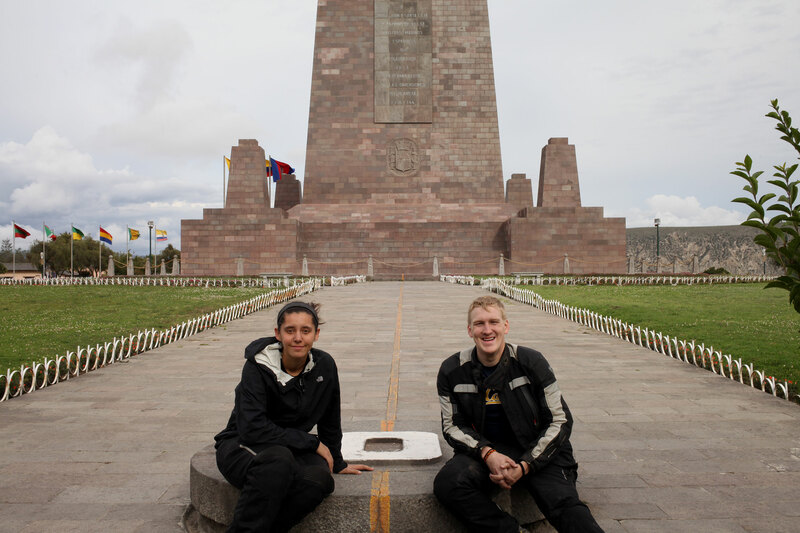 TEAM KLR COLOMBIA was really helpful in answering a few questions for us along our route south and I announced on their wall when we had arrived to Bogota and asked if anyone wanted to ride with us to the Tatacoa desert last Saturday. 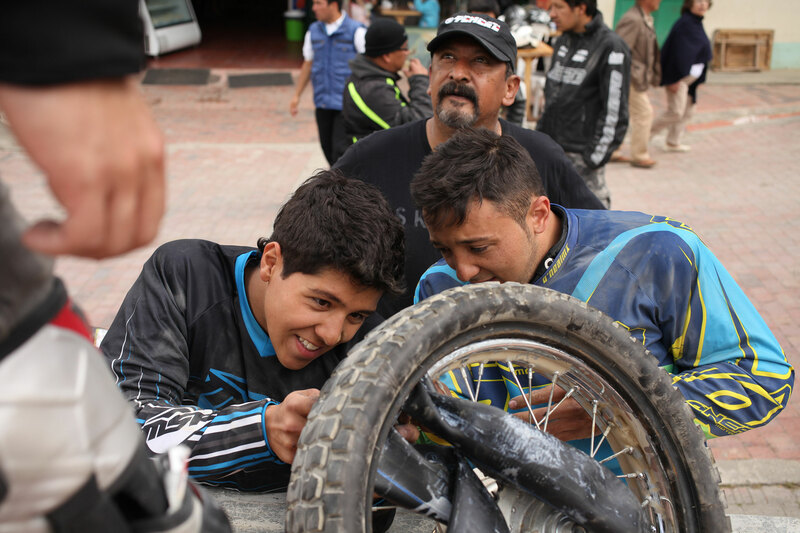 People responded saying there was already a ride planned for Tatacoita on Sunday so Nathaniel and I quickly decided we should hang out in Bogota an extra day so that we could ride with them. The night before the ride we tried to go to bed early because we wanted to have our panniers packed and be ready to roll out the hostel door by 6:30am. It said on the motorcycle invite to meet at 7:30am so after getting direction clarification from the girl at our hostel we decided we should leave an hour early. Our hostel was on Calle 9 and the group was meeting at Calle 193! With almost a two-hundred blocks to ride in a foreign capital we of course left 30 minutes late on two empty tanks of gas. Once we got on the main road heading north out of town we started driving aggressively (speeding) and were pulled over by the cops with just 10 minutes to spare. Luckily for us they weren’t interested in how fast we were going but instead wanted to give us a sobriety test. They were testing all the motorcyclists coming out of town and had already loaded one bike onto their tow truck. Thankfully we got gas and arrived to MAKRO supermarket on Calle 193 only 5 minutes late. As we pulled up, I saw a line of bikes parked waiting and smile spread across my face so big I’m surprised it could fit under my helmet! I had been waiting months for this! As soon as we pulled up a local named Hernando came up to us smiling and introduced himself. He was really excited when we told him how we heard about the group and that we had ridden our KLRs all the way from the US. He took a lot of photos of us while we were there and he introduced us to some of the other guys. One thing about the group was that although it had been organized through the KLR page, it was the most diverse group of bikes I have ever seen riding together. Usually in the United States Harley guys ride with Harley guys, the BMW guys ride with other BMW guys and so on. 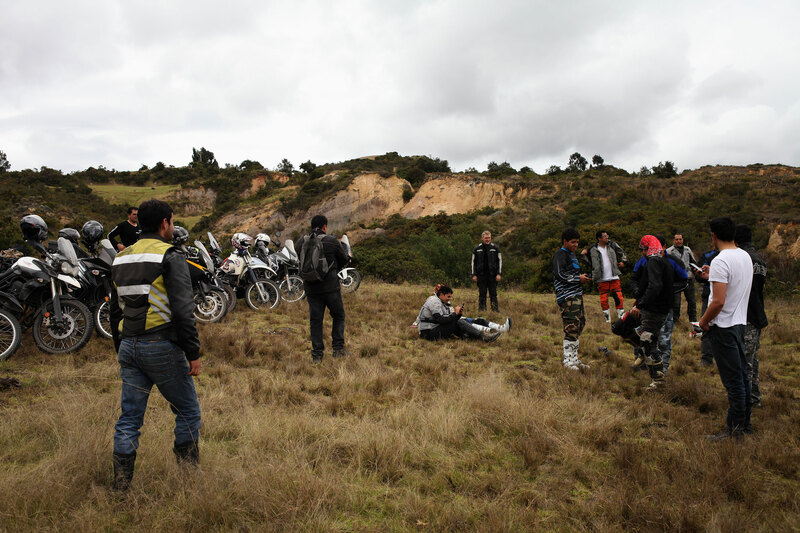 This group had KTMs, Kawasakis, BMWs, Suzukis, Yamahas, Hondas, at least one Triumph and we were later joined by a quad. 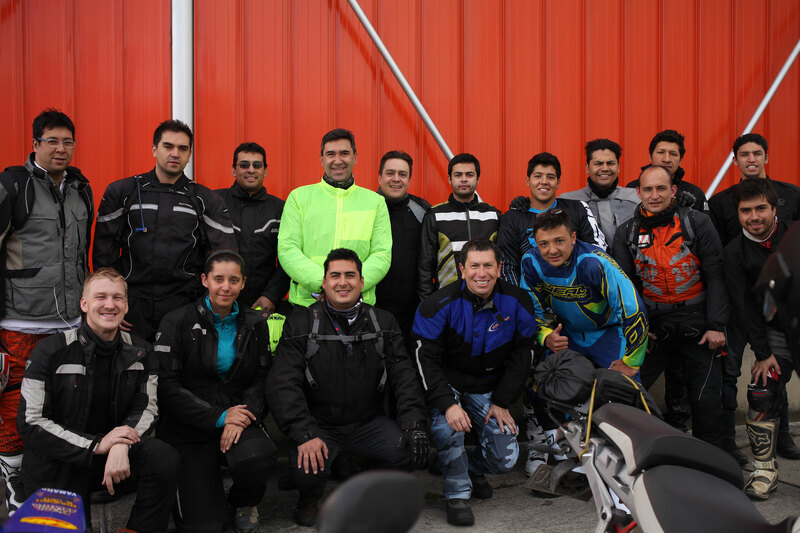 I was just so impressed that this group meets up and welcomes everyone from the GS 1200 riders to 125 cc dirt bikes. They are just guys with motorcycles that want to ride and they show equal acceptance to everyone on two wheels. I keep using the word guys because I was the only female out of 19 riders. We lined the bikes up against an orange wall for a photo opportunity, took a group photo and got directions from the ride organizer about staying safe and how they were going to keep us together. At that point we all got on our bikes, rolled up to the exit of the parking lot, waited for some people to make a few tire pressure adjustments and headed north. We had realized at this point we were going to a DIFFERENT desert than the one we had wanted to visit, nevertheless we had waited too long to meet them to not do the ride to ‘Tatacoita’. We were only disappointed that we had all of our gear packed on the bikes. It’s easily an extra 80 lbs. and we were going to be doing off road riding with them, something Nathaniel and I hadn’t truly tackled yet. Our KLRs are considered dual sports, which means they aren’t the best at off-roading or the best at long distance cruising, but they are good enough at both to be perfect for our trip, they are a jack of all trades. Obviously we couldn’t keep up with the the 1200cc bikes on the open highway, but the organizers were really excellent at keeping everyone together. We waited at the highway exit for the little dirt bikes to catch up and for the quad rider to join us before winding through a small town and hitting our first dirt road. The Colombians (all great riders) were going 40 and 50 mph over the gravel and I tried my best to keep up, however riding that fast on loose material just freaks me out. Just before we exited the gravel for pavement again one of the little dirt bikes got a flat tire so the rest of us waited on the side of the road for them to pump his tire full of enough air to get to our breakfast spot where they could properly fix it. Every time we stopped people were whipping out their phones to take pictures of each other so my camera wasn’t out of place. 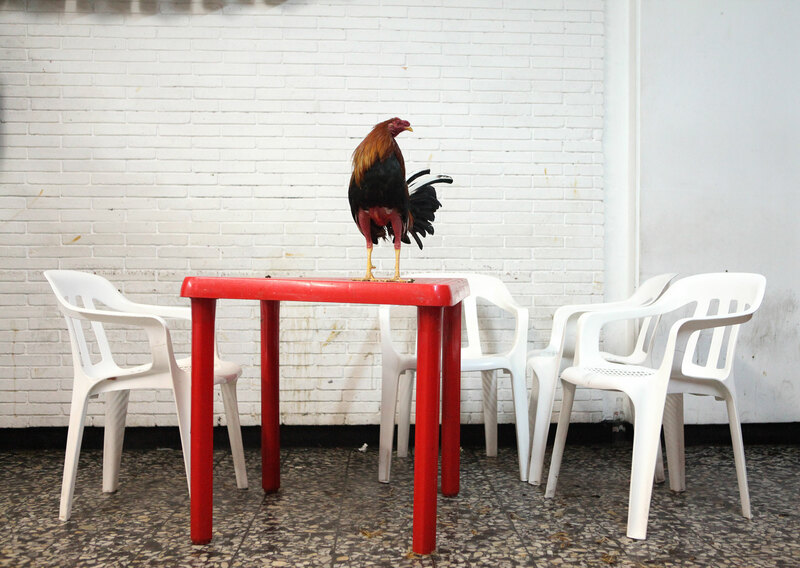 We got to the little breakfast place in a tiny town I do not know the name of and the Colombian posse went to work. Some people immediately began searching for bricks to use as a center stand while other people began unpacking the tools they thought might be useful to fix the tire. Through the whole ordeal people were teasing the young kid who had the flat, though it was all good-natured, like big brothers teasing a younger one taking up a new hobby. As Nathaniel and I talked with people (at least half of them spoke English to some degree) I told myself that everything would be okay if the road stayed like it had been. I hate gravel, but it’s not hard to ride on and I was sure if I just gritted my teeth and said a prayer or two I could try and keep up more than I had been. As they were about half done fixing the tire on the little dirt bike someone noticed one of the other KLRs had a flat front tire. A mechanic nearby was open so Nathaniel dug the extra front tube he carries out of his pannier and gave it to Miguel so that he could replace it to get the group on the road quicker. We lost a lot of riding time hanging out waiting for the tires to be fixed (the grease we carry also came in handy), still it was a lot of fun to soak up the atmosphere and bond with people. 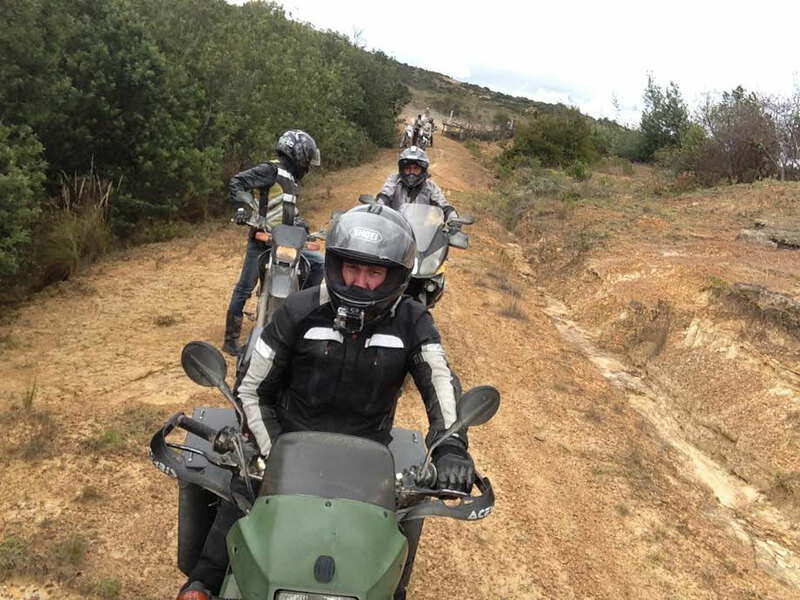 Once we were mounted up and moving again, they took us (VERY QUICKLY) down another gravel road and then we all pulled over as a few of the bikes and a quad scouted ahead of us up a somewhat steep hill. One bike came back and told us the route had been approved so up we went one by one to where we re-grouped at the top. Next up for us was a decent dirt path and some nice hills that we both really enjoyed. Puttering along on those I could keep up much better than on the gravel, however the texture of the road started to get a little insane in places. There were big loose rocks in the road, but worst of all people had filled in places that get muddy in the rainy season with what looked like bricks (just big loose bricks) and sharp looking shards of roof tile. I felt fairly confidant over most of the places with brick and tile because I could weave around the worse bits, still there was this one spot about 10 ft. long in the pathway that I couldn’t see a way around. I didn’t want to ride straight over a pile of loose bricks! I panicked and killed the bike in the middle of the bricks. I was stuck with my tire wedged against one of them and I couldn’t get enough momentum to climb over it. One of the other riders helped me move some of the debris out of the way, which I was really embarrassed about. He didn’t seem frustrated and told me to just relax and it would be okay. Colombians are very aware of their country’s reputation in the United States and many of the Colombians we met were comfortable with openly talking about it or even yes- making jokes about it. One of the riders leaned over and asked me if I had fallen. I told him No – that I had just gotten a little afraid because I wasn’t used to that kind of riding. He nodded in acknowledgement and sat back up on his bike. *Sighing* I turned my bike around and filed into the middle of the line weaving its way back down the hill. Some of the better riders on true dirt bikes went off the path completely, however some of the men rolled their bikes into a little ditch next to where I had gotten stuck and walked their bikes past it. I was relieved to see them do that and followed their example. He couldn’t hear me so I repeated myself loud enough for more people to hear me and they cracked up in agreement telling me yes it was true – they do take more pictures of their bikes than their girlfriends. It was time to get back on the bikes and then the road started to get really intense. It started easy enough with a slow climb up a small hill that had some ruts in it, yet few rocks. On one of the hills one of the guys went over so the rest of us paused while they helped him get upright again. I was ashamed to secretly admit to myself that I was both glad he was okay and glad that I wasn’t the first to fall. Nathaniel soon went over as well and I took another deep breath knowing the inevitable would soon come. Eventually we came to a steep gravel decline that turned immediately left at the bottom becoming a gravel climb with a hairpin turn to the right half way up to the top. I got almost to the hairpin turn, however the rider in front of me had slowed down so much… I lost my momentum and over I went into the gravel. I turned my bike off and thanked the guys that helped me pick the bike up. They held it stable on the incline as I got back on and put it into first – I pulled away from them trying to gain enough speed before I reached the turn, but couldn’t quite get going enough… I fell over again not 10 feet further up the hill and the same guys helped me pick the bike back up again. I apologized profusely, though they were the epitome of caballeros. They told me not to worry, breathe and it would be okay. Calm down they said – don’t worry! The three of us made it up to flat grass field at the top without further incident and I announced to everyone after Nathaniel asked what happened that I had fallen DOS VECES. One of them asked me if the bike was okay and I responded in Spanish: “Oh of course, the KLRs are mules!” They seemed really surprised that I was still stoked about EVERYTHING. And why wouldn’t I be? I wasn’t doing very well on the terrain, nevertheless I was riding around the Colombian countryside with a whole group of locals and my boyfriend. We were exactly where we wanted to be at that moment and it was glorious. The weather was perfect and we were enjoying the freedom of it all. After everyone took their photos at the top it was time to head back down and Nathaniel decided to follow behind me in case I needed help again. I gave the rider in front of me a lot of room as I started back down the hill of doom, but I slowed myself too quickly on the gravel. I felt my back tire start to slide out from under me as I fell again in almost exactly the same spot I had fallen the second time I was going UP the hill. I turned my bike off and stood up quickly as Nathaniel tried to park his bike on the steep decline. He and another guy once again helped me pick the bike up and I got back on (probably cursing). I started down the hill again and not a minute later hit a rock or something that forced my steering column violently to the left and threw me to the ground. I felt my leg get smashed between my bike and the rocks as I fell onto my elbow with most of my body weight. The first three times I fell hadn’t hurt at all… but this one took my breath away. I yanked my leg out from under the bike and turned the ignition off as I laid my head back on the ground. I’m not sure what I was thinking about as I indulged in a few seconds of self pity laying there like a child but I’m sure they were all adult words. It hurt – but I was mostly worried about looking like a loser in front of all our cool new friends. I sat up and started tossing the shards of broken mirror off the path as I heard Nathaniel coming up behind me. With the boxes on it I can’t pick the bike up by myself so I had to wait till he got there anyway – that part was not self indulgent. We caught back up to the group (they weren’t that far) and I announced as cheerily as possible that I had fallen DOS VECES again. A few guys came and looked at my bike and I showed them how I had broken my mirror. One of them took some phone photos of me as I gave him a thumbs up. I knew that they could forgive me for slowing them down (especially since I was such an anomaly), but they wouldn’t be able to forgive a bad attitude. We left the park (spoiler alert – I didn’t fall again) and stopped one more time at a small store a few miles away. We all grabbed cokes and cookies and had our last conversations of the day as people started to slip off into the afternoon. 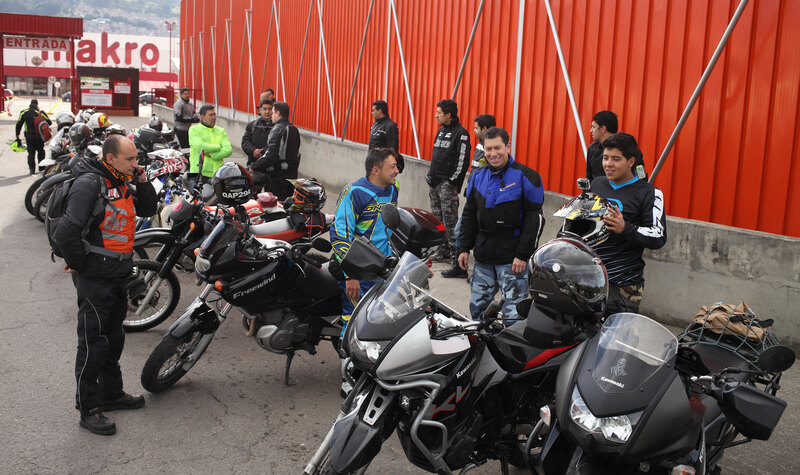 A lot of people came to say goodbye to us and a few hugged us as we put our helmets on to ride back to Bogota. People exited the highway in small groups and finally one last rider honked and waved and it was just Nathaniel and I navigating our way through the streets back to the hostel all alone. My ankle and shins are now some really awesome swollen shades of blue and I have a few inches of skin missing from my forearm, still the day we got to go off roading with the Colombians is going to be one of my favorite memories of the trip. Hernando indulged me and took a photo of the group with my camera too. 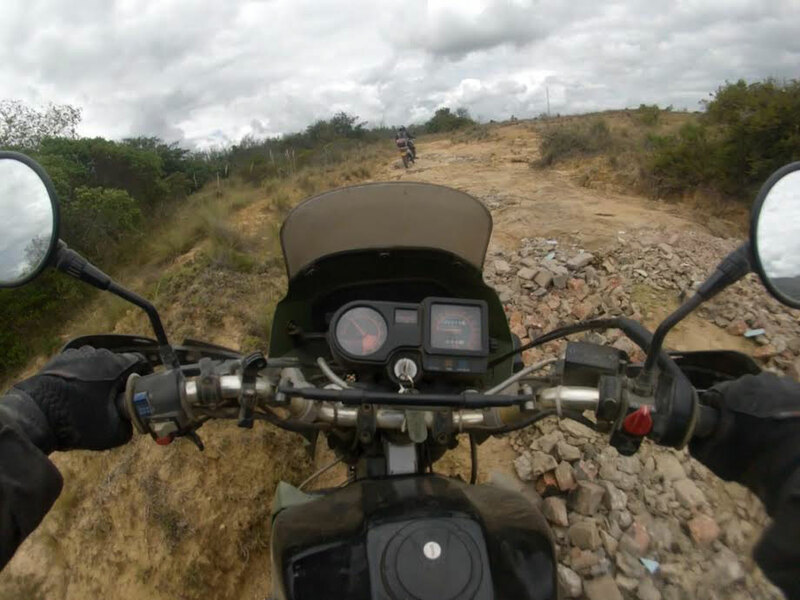 Photo: Hernando Herrera R.
Riding into Bogota, the capital of Columbia, was nothing like I expected. A few days earlier we had cruised into Bucaramanga, which you enter via mountain roads that give a view of the entire city as you crest them. This is what I expected when coming into Bogota, a city of 6.73 million people, but as Alex and I entered the city the limits, the city only slowly grew up around us. In what reminded us of LA, and to a lesser extent Sacramento, Bogota is expansive, a main city built years ago that was expanded in the following decades. LA is 503 square miles, and Bogota is 613, which should give you an idea of how far it stretches. In a normal city the streets from north to south and east to west will be labeled Calle and Carrera, think street and avenue, and wont normally go past twenty or thirty. At the beginning of where Alex and I started we were at Calle 222, and we needed to get to Calle 9. Bogota brings together quaint neighborhoods, dirty trash heaps, museums, universities, street vendors, and churches in a way few other capital cities we have visited do. In La Candelaria, where our hostel was located (side-note: Musicology Hostel is one of the best hostels we have stayed at on this trip. The staff are friendly, the vibe is chill, and you can park a motorcycle in the entrance!) is the historic old town, full of churches and museums. It has a smaller town feel, until you ascend the church on Monserrate and get a full view of the city and how far it reaches. 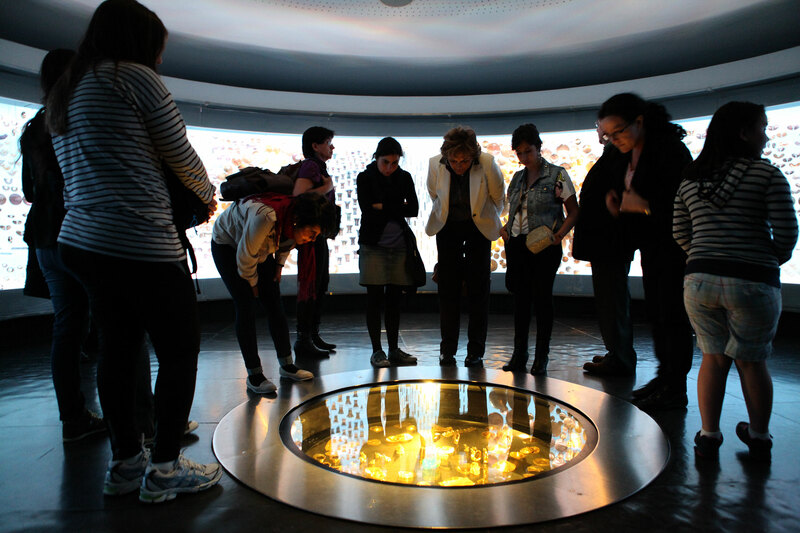 While there could be many associations with Bogota, the City of Museums should be one. Within a six block radius of our hostel, there were at least five museums, and probably more that I am not aware of. 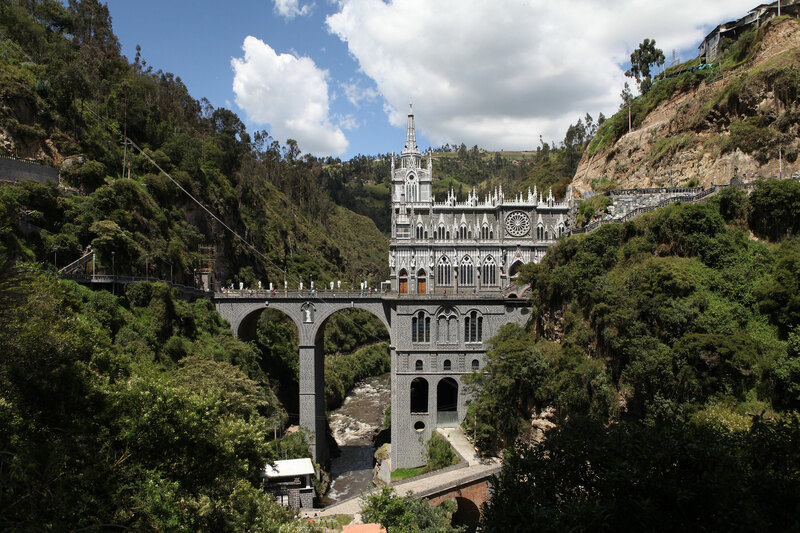 There is the Military Museum, the Botero Museum, but the most prominent would be the Gold museum, which show cases gold workings from all over Colombia and easily has over 6,000 pieces on display. It can get a little overwhelming by the end and there are three sold floors of exhibits to peruse, though I was told Pablo Escobar’s gold Harley Davidson would be there and was slightly disappointed when I didn’t see it. 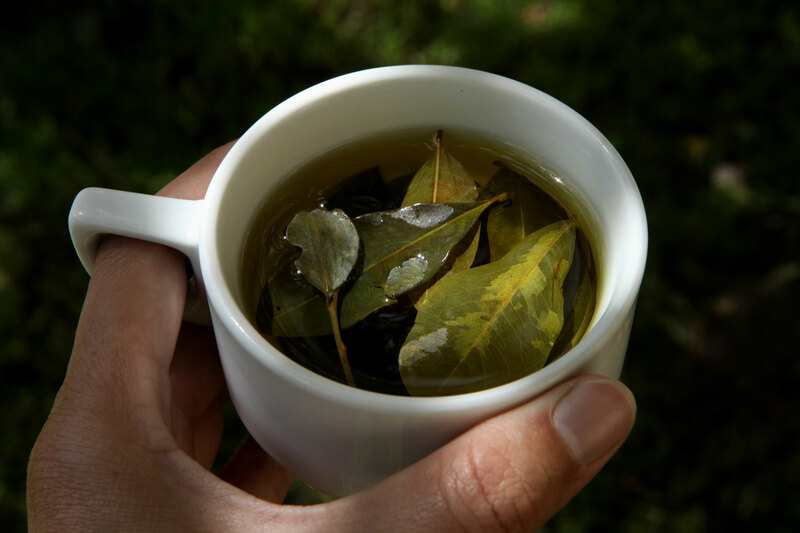 Bogota is located in a high plateau situated in the Andes mountain range, which means that it was a bit on the cold side even though it is middle of summer in South America. What helped to take the chill off was a local dish to the region, hot chocolate with cheese and bread with butter. We were a bit confused on how to eat the dish and ended up just dipping the cheese in the hot chocolate and nibbling on it only to find out later that you’re supposed to mix the cheese in and let it melt a little while you eat the bread and then drink the chocolate with the melted cheese inside of it. As Alex mentioned in her previous post, there is a plethora of street food in Bogota, and many restaurants serving up traditional favorites such as Ajiaco (Colombian chicken soup) and tamals (think Mexican Tamales, but cooked in plantain leaves and considerably bigger with a softer form of masa). We weren’t left wanting once again for restaurants, but it is still hard to find good places among all the mediocrity, however asking locals and police officers never fails to produce results. 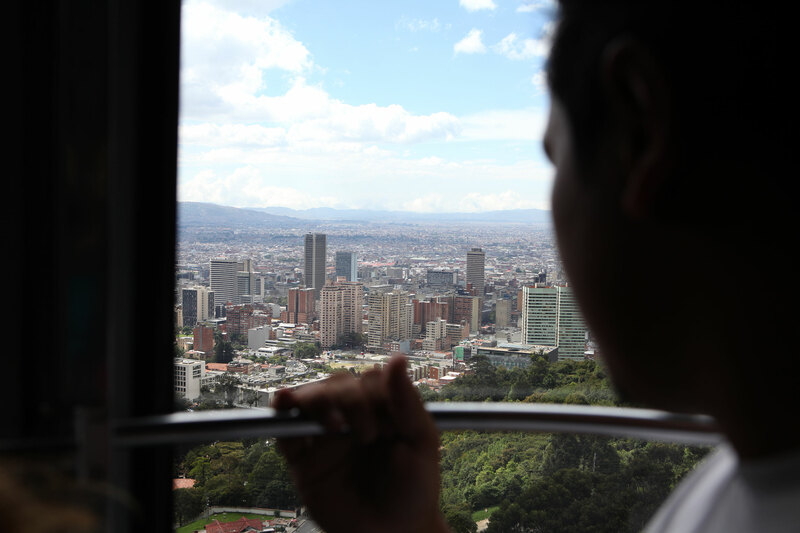 Bogota is so expansive you couldn’t ever explore all of it, from the historic downtown, to the more modern financial district (that has a building that at night would put Las Vegas to shame), to the outskirts with its apartments and neighborhoods. 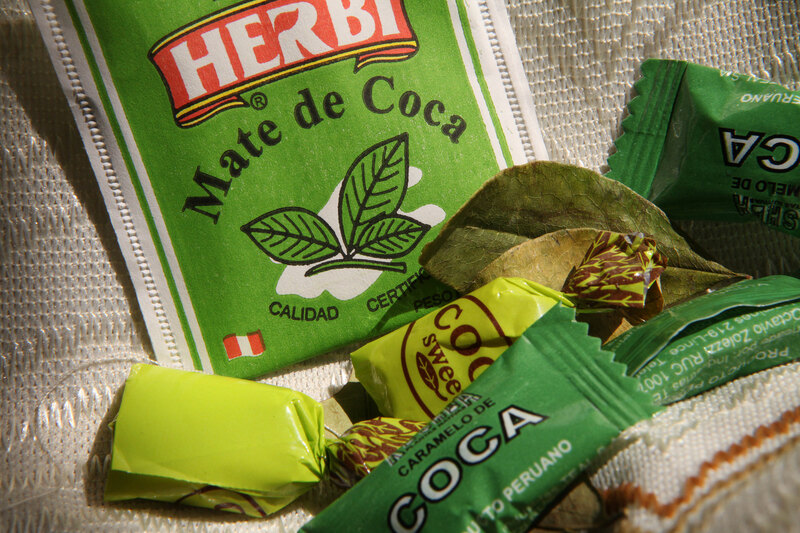 Alex and I enjoyed our time in Bogota, and thought it was the city that most surprised us thus far on the trip. Sure it is big and loud, like most capital cities, but there are treasures to be had if you put in the time to find them — and have a really great hostel to stay at!